gem and I did our first flashpoint (think dungeon in WoW) a few weeks ago, but I never mentioned it. It was the Black Talon, and it was pretty fun. The Black Talon is an Imperial ship that was scheduled to travel to Dromund Kaas from the Vaiken Spacedock in the Imperial Fleet. After boarding the ship, we learn from a Grand Moff that there’s an Imperial defector on the Republic ship Brentaal Star, and he wants him retrieved. 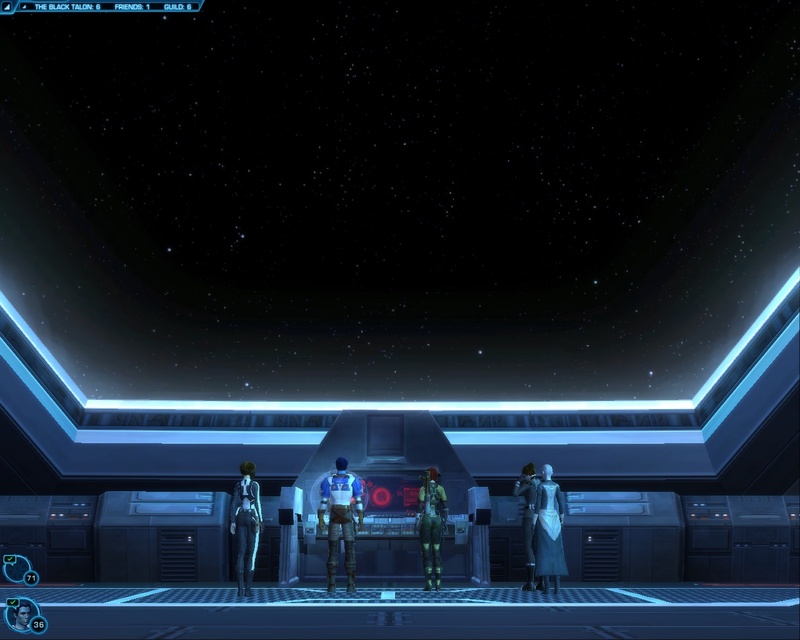 Over the course of the flashpoint, we repel Republic troops, board the Brentaal Star ourselves, kill a Jedi Padawan, and retrieve the defector. Following the same concepts from quests, flashpoints seem to be use story and dialogue heavily and have branching story points. It’s also very cool that two people, using companions, can do it alone (or four people could without companions). The Black Talon was very fun. 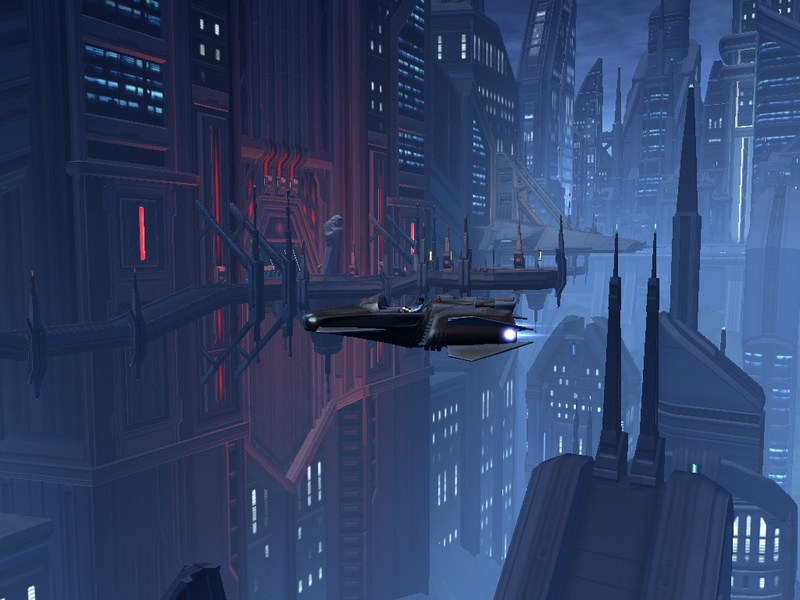 Dromund Kaas, the Imperial capital, is a lot of fun so far. The map is only about half explored, so I’m sure we have a lot left to do. I spend a lot of time fiddling with crew skills, so I’m questing slower. Starting players on Hutta was a huge mistake in my opinion. Hutta is just so ugly. This is the same mistake Blizzard made with orcs and trolls in World of Warcraft. Don’t start players in an ugly location! Dromund Kaas is cool looking; hook us there! Anyways, it’s cool to see the capital nice and early. I’ve also been playing Huttball! 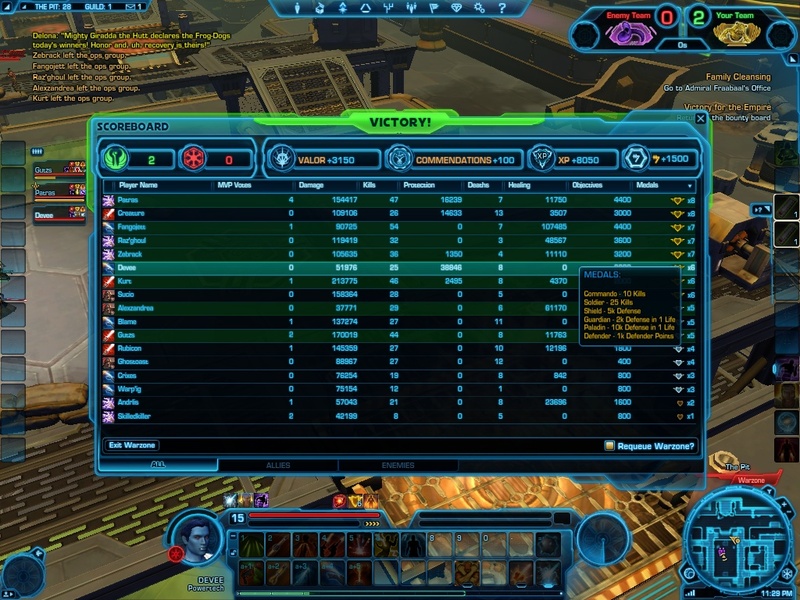 Huttball is a warzone, which is like a battleground. Oh man, this is fun. I haven’t been this excited about PVP in a long time! Cataclysm’s PVP involved two rehashes (Battle for Gilneas and Twin Peaks) that I didn’t enjoy as much as the original and a world PVP zone that seemed more up to chance than anything else. Huttball is like capture the flag with a single flag in the middle if the flag could be thrown. Comparing it World of Warcraft again, it’s like Warsong Gulch if there was only a single flag right in the middle. The system for PVP gear is strange. To summarize, you keep spending commendations on more expensive types of commendations. At least, that’s the basic idea. I don’t have a firm grasp on it yet, but I don’t believe I need to understand at it at such a low level. The game puts people of all different levels together and does some sort of scaling to allow them to play together. I’m not sure how it works. It seems to me that low level players would still be terrible because they don’t have their skills or abilities yet, but I seem to be doing okay. Medals are awarded during the warzone for performing certain tasks like doing a certain amount of damage or healing. They’re like achievements that can be repeated once per battle. The more medals you earn, the more reward you get at the end.